Increase economy through technical control – you simply won’t require as much air exchange to do the same amount of work. It is easier to get to air and get sufficient exchange. That takes care of a great deal of the complaints swimmers have with breathing. Like using a smaller gear (faster cadence) on a bicycle, you can speed up the tempo while reducing the pressure per stroke, then insert a breath every 3 strokes. You may find this easier than using a slow tempo, keeping as much pressure per stroke and inserting a breath every 2 strokes. Once you add up the amount of effort and the frequency of breaths over the length you may find that a shorter stroke at higher tempo, with more frequent-but-smaller breaths are more comfortable to maintain. 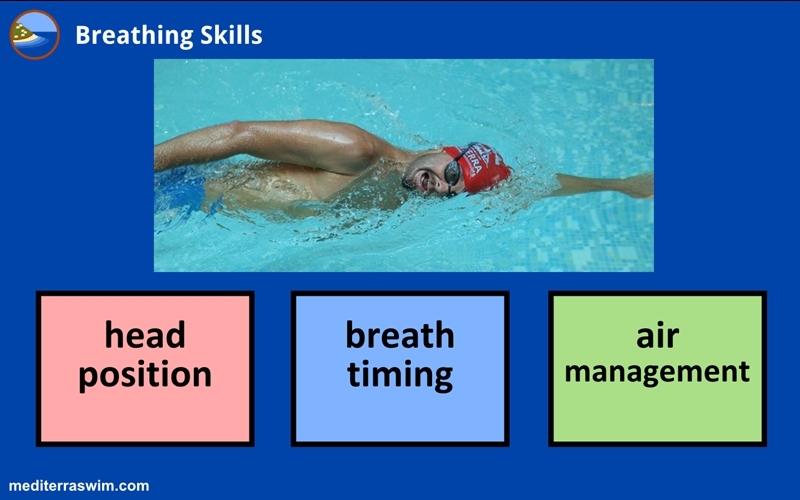 With those four variables you have a lot of room to experiment in finding a more sustainable stroke+breathing pattern for each event. There is no way around it – we can work on perfecting technique forever but at some point we’ve got to increase effort and add power in order to go farther and go faster. (I spent a good portion of Smooth Strokes blog space over the last year explaining this). Let’s say you and your TI Coach feel you’re stroke is quite economical at short distances, yet you start to feel breathless at around 150 meters. What’s going on? You may have reached the end of ‘Easy Speed’ benefits your early TI training provided you. You will only increase your comfort for swimming beyond 150 meters by swimming into the discomfort past 150 meters and training there. Like the burn of good stretching in order to lengthen those tissues, you have to swim into that burn of breathlessness and muscle fatigue in order for your body to be provoked to adapt to it. There is just no other way to adapt your metabolism and muscles to longer distances. As a matter of fact, the science of fitness behind aging is pointing us to the reality that increasing and then maintaining fitness longer in life is directly dependent on our dosage of high intensity training ( high intensity = uncomfortable in terms of breathing and heart rate and muscle burn). So, to expand your comfortable swimming distance and speed – no matter how fine your technical control is – you have to swim into the uncomfortable zone to do it. And further more, the more you avoid discomfort (of this kind), the faster your comfort zone will shrink with age. That’s the hard word I am hearing from the experts on aging and fitness these days. There is eu-stress (positive stress on the body) and dis-stress (negative stress on the body). One one hand we are training to listen carefully to the body in order to remove unnecessary stress and strain, to make things flow better, make things feel better. One the other hand, there are many strong sensations that are unavoidably present when you work your body at higher intensity or over longer distances. They are normal and they are healthy. Rather than label these as ‘unpleasant’ it is possible to retrain your brain so that they are regarded as positive sensations rather than negative, so that you associate them with good things rather than danger. For those who are unaccustomed to high/long intensity efforts, in the early stages of a swim – especially when you have started out too hard – when these uncomfortable sensations are building up, this can trigger some anxiety or fear. The brain mistakenly worries that if those sensations keep building and building like that, surely the body is going to explode! But in fact, those sensations may just rise to a certain level and, if you keep the same effort level, those won’t actually increase. And, if you concentrate on focal points which restore your economy, after 300 or so meters it will start to feel easier again. Essentially, this is the intended effect of a good warm up and the reason we emphasize doing it with quality every practice, every swim. Just be aware that some amount of the breathlessness is appropriate – it’s the normal state you’ll be in when working at higher speeds or longer duration, and you can not only get used to it, but come to like it.